Our railway expert Andrew Sharp, the former Director of the International Air Rail Organisation (IARO), was a real glutton for punishment and attended both Runways UK and Tomorrow’s Rail which followed. He focusses on Crossrail for London City, Heathrowrail access from the south, which would include Waterloo, and the planned HS2 at Old Oak Common. On day two of the Runways UK conference at London’s Tower Bridge Grange Hotel last week (see in this issue), Declan Collier, Chief Executive Officer of London City Airport (LCY), highlighted the potential of an LCY station on the Abbey Wood extension of Crossrail under the Thames. The new east-west cross-London railway, he said, ran underneath the western touchdown point to the airport and came into the open air a short distance south of the terminal, close to the former Silvertown station. He pointed out that access from the Custom House Excel station would result in more road traffic and pollution. In the Tomorrow’s Rail conference the next day, Chris Sexton, Technical Director of Crossrail, gave this concept a very firm ‘no’ in response to a question from BTN. He is clearly focussed on project delivery and proud of fighting off ‘delivery creep’ – any good project manager will want to freeze a plan and build it, knowing that changes after construction start are a good way to go outside the budget. So if the aviation industry wants even better rail access to London City Airport – which already has one of the highest rail access mode shares in the world – it will have to fight hard for it. BTN gathers that the additional station is practical, would not affect the scheme’s delivery and would add two minutes to the timetable. Better news for Heathrow came from the airport and the London Borough of Hillingdon, putting together what might be described as an aerotropolis concept in the shape of a major development (housing, offices, hotels) south of the airport at Bedfont Lakes. This will be facilitated – enabled – by a new Southern Rail Access scheme for the airport. The old plan for rail access from the south, Airtrack, made use of the former branch line to the west of the airfield, between West Drayton and Staines West. On the map, it appears a very easy piece of railway to create, but in practice it wasn’t. 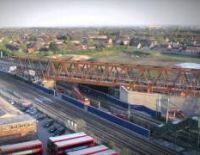 Major work would have been needed at the southern end to create a new connection to the rail network south of the Thames at Staines. This was one obstacle: another was the likely increased use of level crossings in south-west London, something strongly opposed by the residents. The new scheme connects to the southern rail network at Feltham on a triangular junction (so that trains will be able to run south from Heathrow and turn either left towards London or right towards Woking). When challenged on level crossing issues, there were two answers. The first was that trains would be existing ones, diverted to serve Heathrow, and not new ones – so there would be no increased use of the key level crossings. They will serve the airport four times an hour outside the commuter peaks, but probably less often in the peaks so that commuters will not be unduly disadvantaged. The second was that technology in the shape of the European Rail Traffic Management System (ERTMS) might reduce level crossing closure times anyway because of a greater responsiveness to train speeds and positions, and the Government has said that it does want to get rid of these relics of Victorian railways. It is just a question of money. The London terminus of HS2 is planned to be at Euston station. This is away from the city’s business districts and is not well served by the tube network, so the plan is that there will be an additional London station at Old Oak Common, currently the site of a train maintenance depot on the Great Western Main Line west of Paddington. There are major plans for housing and office development at nearby Park Royal. There may be a rail connection to Gatwick too. At one stage there were plans for a direct rail connection from HS2 to Heathrow, with half-hourly trains from Leeds and Manchester direct to the airport. This is still possible but currently it is deemed to be not good value for money – passengers will have to change at Old Oak Common.